The Beginner's Guide is a surreal and immersive narrative about Davey Wreden's (Stanley Parable) developer friend, and why he retired. The way the game takes full advantage of what a medium like video games have to present is interesting, and smart. So let me get this out of the way first and for most "Hold W to game". That's it. It's even less "gamey" than the Stanley Parable. I want people to understand this before even considering the Beginner's Guide. There's no mechanics, there's no real choice, it's very much a linear hour and a half trip being lead by Davey Wreden as the narrator. With that said, The Beginner's Guide really can't be told in any other form than through a video game. 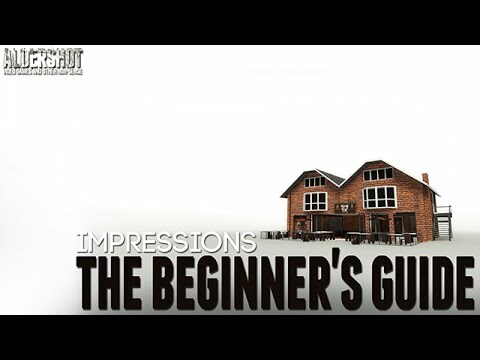 The Beginner's Guide: Impressions + First 10 min pure, (gameplay, and review) Relevant information and links below The Beginner's Guide is the follow up to Davey Wreden's Stanley Parable. Since the story is about Davey's developer friend, it takes you on an interactive tour through his friend's past games and levels. The game's aesthetics and concepts progressively get better and complex over time. The game is also very forth wall breaking, immersing the player into the narrative as a character in this story itself. Davey will often make reference to you, as you play through the game. It's a surreal experience, and it certainly breaks all sorts of video game norms. If you're looking for a unique experience or just like really well told stories, The Beginner's Guide is an easy recommendation. However, if you're looking for a game, even for an off beat game, The Beginner's Guide might disappoint. As mentioned above, there's really no mechanics to speak of, other than hold W to game. In Gone Home you have to look for keys and can interact with objects all around. In The Stanley Parable you have a pseudo fail state and an Easter egg hunt for all the endings. Even in most other "Walking Simulators" you have some kind of puzzle, or obstacle along the way. Not in The Beginner's Guide. There's only 1 puzzle in the game, and that's solely there as a story element. There are dialogue choices to be made, but they have no significant (or any) effect on your game. It's very much a guided tour through an interactive narrative. It's also relatively short at an hour and a half (I finished it at exactly 91 minutes). But if you're able to focus on the quality of the experience the game tries to deliver, and willing to let go your previous conceptions of what to expect from a video game, The Beginner's Guide is top shelf material. Overall The Beginner's Guide is a story that could only be told through a video game, yet ironically is one of the least "gamiest" game I've ever played. The story is surreal, immersive, and certainly something to be experienced for fans of great narratives, but the title of "video game" will be controversial to some on this one.